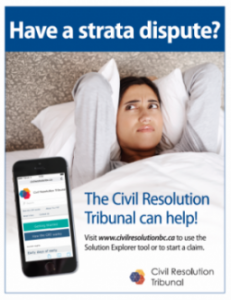 The Civil Resolution Tribunal provides an accessible forum for the resolution of a wide variety of strata property disputes and small claims matters. The tribunal encourages people to use a broad range of collaborative dispute resolution tools to resolve their disputes as early as possible, while still preserving adjudication as a valued last resort. It is intended, as with the Family Law Act, to encourage a collaborative, problem-solving approach to dispute resolution, rather than the traditional adversarial litigation model. In order to cut cost, delay and complexity for the users of B.C.’s justice system, the Civil Resolution Tribunal combines technology, case management and dispute resolution processes. 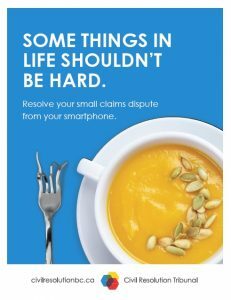 The CRT is the first step for people with small claims (up to $5000) and many types of strata disputes. People will have, however, the right to request that a court hear their matter. almost all builders’ lien matters. In addition, the federal government cannot be sued in Provincial Court. The Civil Resolution Tribunal encourages early resolution of disputes through online information and resolution, telephone facilitation and other such services. The CRT offers free self-help information pathways and tools that can be used to help people better understand the issues and explore early resolution options in strata disputes and small claims. Participants in a dispute can work on disputes through the CRT on their smartphones, laptops and tablets 24/7, from the convenience and comfort of their home. Telephone and mail services are also available for those who can’t access the internet. Those who can’t resolve on their own can apply to the CRT for help – creating a resolution with the others involved or getting a binding, expert decision from a tribunal member. The tribunal has been resolving strata disputes since July 2016, encouraging collaborative agreements and making binding decisions when people cannot agree. For the small number of cases where formal adjudication is required, the tribunal actively case manages the dispute so that the adjudication is conducted quickly and efficiently. In all cases, the level of resources applied to a dispute will be proportionate to the nature of the dispute and the issues involved.